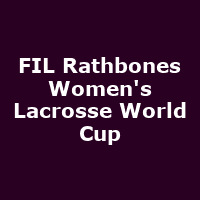 The 2017 FIL Rathbones Women's Lacrosse World Cup will be the largest elite women's sporting event in the UK and the largest Women's Lacrosse World Cup ever. There will be 28 teams competing, including reigning champions USA, Canada, Australia and host nation England.Lacrosse is a fast, athletic, and highly skilful game that is exciting to watch, even if you don't know all the rules. There are no points for style, none for artistic interpretation, the team who scores the most goals wins. It couldn't be simpler."